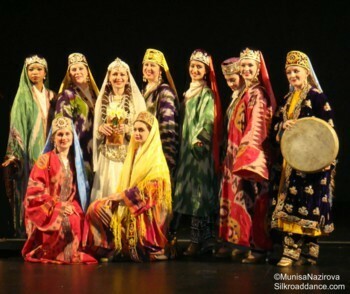 Since we were founded in 1995, the Silk Road Dance Company has performed at numerous Iranian, Afghan, Egyptian, Lebanese, Libyan, Tajik, Uzbek, Azeri, Indian, Pakistani and Zoroastrian weddings throughout Virginia, Maryland, Washington D.C. and New York. We have a delightful selection of dances appropriate for joyous celebrations. With lavish costumes, we can bring to life the many rich traditions of Eastern cultures. Just give us a call at 301-585-1105. Silk Road Dance Company specializes in wedding traditions from Middle Eastern and Central Asian cultures. The ensemble often works with Exclusively Events, known for their elegance and taste. Enjoy glimpses of Silk Road Dance Company's performance at a lavish Persian wedding held at Washington DC's Four Seasons Hote.l in this video at 2:18, 2:33, and 3:08. Rich in beautiful traditions, Azeri weddings are enlivened with elegant and energetic dances, sure to delight family, friends, and guests. Here Silk Road Dance Company poses after a wedding performance at Washington DC's historic Willard Hotel. 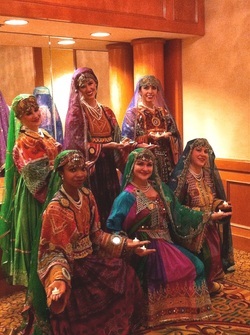 Silk Road Dance Company offers the traditional Egyptian wedding procession known as "Zaffah." In addition to the Zaffah, the ensemble's repertoire includes several Egyptian folkloric dances and a variety of costumes. Bollywood Weddings are fun for everyone. Silk Road Dance Company has several joyous dances that are perfect for a Bollywood theme event. Each choreography is performed in a different set of exquisite costumes. songs captivate guests at Afghani weddings. by Silk Road Dance Company. Silk Road Dance Company presented a concert of Uzbek, Tajik, Afghan, Turkmen , Azerbaijani dances and more at the College of New Jersey. For the finale, they presented a dance of the Bukharan sozanda.